Under the Airworthiness Verification and Production Lot Testing Program, Constellation Technology demonstrates our capability to evaluate manufacturing processes including machining operations (such as cutting, grinding, hobbing, forming, boring and honing); metal forming techniques (such as casting and forging); assembling and joining techniques (such as welding, brazing, and soldering); heat treatments; surface treatments (such as shotpeening, carburizing, and nitriding) and platings; non destructive testing; coatings and finishes. Constellation Technology performs a visual inspection of the as-received package to identify any shipping damage, corrosion, and verify correct package labeling information. Part markings are verified to be in accordance with shipping documents and the Technical Direction Order (TDO). Any discrepancies are reported and any non-conformances documented in the final report. Photo documentation is provided of any non-conformances related to as received conditions. Visual inspection is performed to verify presence and adhesion of paints, primers, lockwires, thread-locking substances, grease, and any other assembly substance or subcomponent. Visual inspection is also performed to identify and verify marking requirements. Photographs are included to document visual inspections when feasible. Dimensional inspections include conformance inspections of components to the degree of accuracy required by the inspection plan, drawings, and specifications. Constellation Technology provides advanced metrology solutions by inspecting: precision dimensional measurements, compliance with specifications, and verification to standards. Nondestructive inspections include: magnetic particle, dye and/or fluorescent penetrant, radiographic, ultrasonic testing etc. 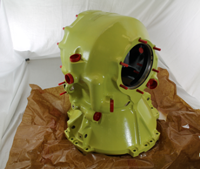 When an Eddy Current Inspection is required and specified as a Critical Characteristic in the inspection plan, Constellation Technology performs a Magnetic Particle Inspection per ASTM-E-1444 or Liquid Penetrant Inspection per ASTM-E-1417 as appropriate, and a Radiographic Inspection per ASTM-E-1742. Functional testing is performed as specified in the inspection plan. The common testing performed includes: proof loading, push out forces, weight, and breakaway torque measurements. Material inspections include analysis of component material, metallic or non-metallic, to establish compliance with applicable material requirements as directed by the inspection plan. Constellation Technology performs sectioning and other destructive tests of components where necessary to determine material properties/composition. This includes: hardness checks; case depths; temper; conformance to material specifications; metallurgical analysis, including visual/microscopic inspections; and other state-of-the-art inspections and evaluations as directed. All specified components have the base metal quantitatively evaluated for the specified elemental chemistry composition in accordance with the inspection plan, drawings, and specifications.